The Spiritual Wisdom of the Gospels for Christian Preachers and Teachers is a lectionary-based resource that references both Roman Catholic and Revised Common Lectionaries, making it useful and relevant to all Christian denominations. 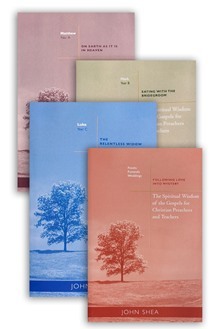 This four-volume set is ideal for Christian preachers and teachers, and those who meditate on and are drawn to the Gospels. John Shea is a theologian, author, and storyteller who lectures nationally and internationally on storytelling in world religions, faith-based healthcare, contemporary spirituality, and the spirit at work movement. This is an invaluable [series of] commentary. John Shea breaks open the word of God in extraordinary ways. It is rare that one of his reflections doesn't contain a stunning new insight. He draws upon the best studies in Scripture but also upon spiritual wisdom as it is found in literature, poetry, psychology, and other religious traditions. He makes all the deep connections and has worked for years in honing a language that is [so] direct, it stares you in the eye. Anyone preaching or teaching on the Gospels will be helped by this commentary. I have shamelessly borrowed insights from him and if I were down to just one [series of] commentary on the liturgical readings it would be this one.